Complete Water Taxi Ride lasts 90 minutes or choose to do hop on and hop off for site seeing, leaving every 45 minutes from the pier. 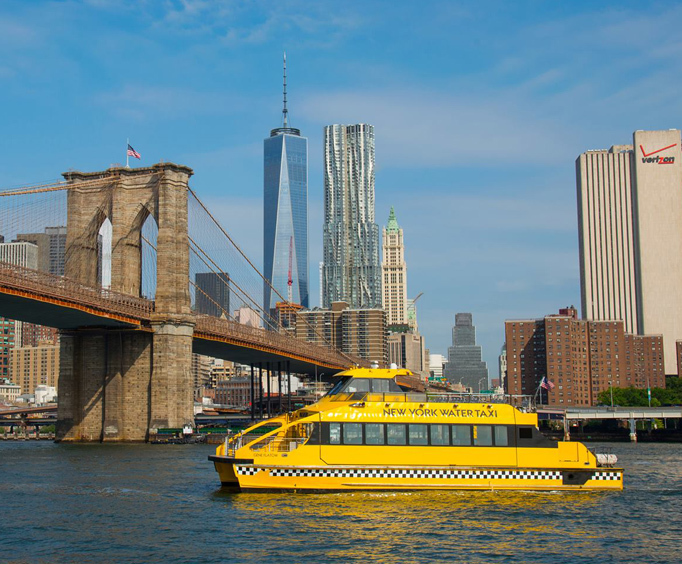 With the New York Water Taxi, you can enjoy a One Day Hop-On/Hop-Off Pass that will allow unlimited use throughout the duration of your pass, with the taxi serving nine popular areas of New York City. 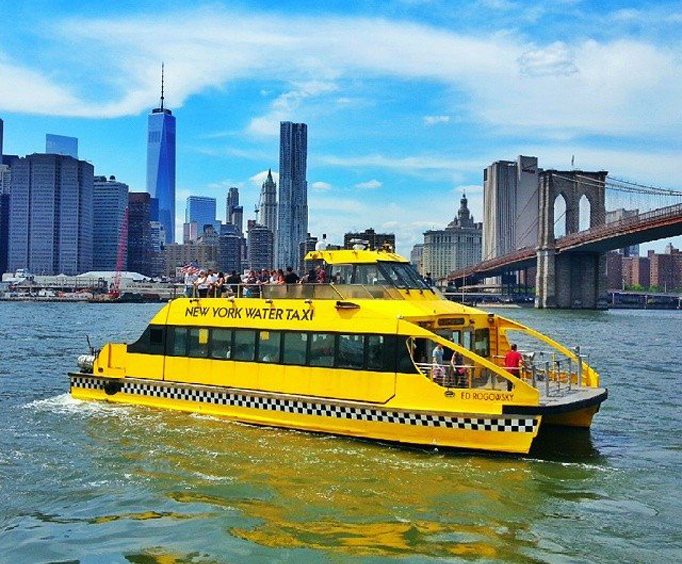 Whether you tour in the rain or shine, the New York Water Taxi offers climate-controlled, interior cabins that will keep you warm and dry, or just out of the wind as you make your way to where you need to go! The boats are designed with low-wake hulls and low-emission technology, so you can rest assured that you aren't disturbing the environment as you take in some of the best sights on the harbor, such as the World Financial Center, Battery Park, Hunter's Point South, 34th Street, and many more! Enjoy panoramic views from the decks of the Water Taxi as you sail on a custom itinerary that includes all of the sights you want to see, while allowing you the freedom to hop on and off of the taxi as you please, in case you want to explore an area of interest. You can hop on or off at any of the five piers the Taxi makes a stop at and discover some of New York's landmarks and hidden gems. This is a tour experience you can take at your own pace, so make sure you bring your camera to capture all of the history and architecture you're guaranteed to see! Greenwich Village, often referred to by locals as simply "the Village", is a largely residential neighborhood on the west side of Lower Manhattan in the city of New York City, in the U&period;S&period; state of New York. A large majority of the district is home to upper middle class families. Greenwich Village, however, was known in the late 19th to mid 20th centuries as an artists' haven, the bohemian capital, and the East Coast birthplace of both the Beat and '60s counterculture movements. The World Financial Center is a complex of office buildings located across West Street from the World Trade Center site in Lower Manhattan in New York City. Overlooking the Hudson River, the World Financial Center has been home to offices of various companies including Merrill Lynch, RBC Capital Markets, Nomura Group, American Express and Brookfield Asset Management, among others. The South Street Seaport is a historic area in the New York City borough of Manhattan, located where Fulton Street meets the East River, and adjacent to the Financial District. The Seaport is a designated historic district, distinct from the neighboring Financial District. It features some of the oldest architecture in downtown Manhattan, and includes the largest concentration of restored early 19th-century commercial buildings in the city. This includes renovated original mercantile buildings, renovated sailing ships, the former Fulton Fish Market, and modern tourist malls featuring food, shopping and nightlife, with a view of the Brooklyn Bridge. Battery Park is a 25 acre public park located at the Battery, the southern tip of Manhattan Island in New York City, facing New York Harbor. The Battery is named for the artillery batteries that were positioned there in the city's early years to protect the settlement behind them. At the north end of the park is Castle Clinton, the often repurposed last remnant of the defensive works which inspired the name of the park, the former fireboat station Pier A and Hope Garden, a memorial to AIDS victims. At the other end of the park is Battery Gardens restaurant, next to the United States Coast Guard Battery Building. 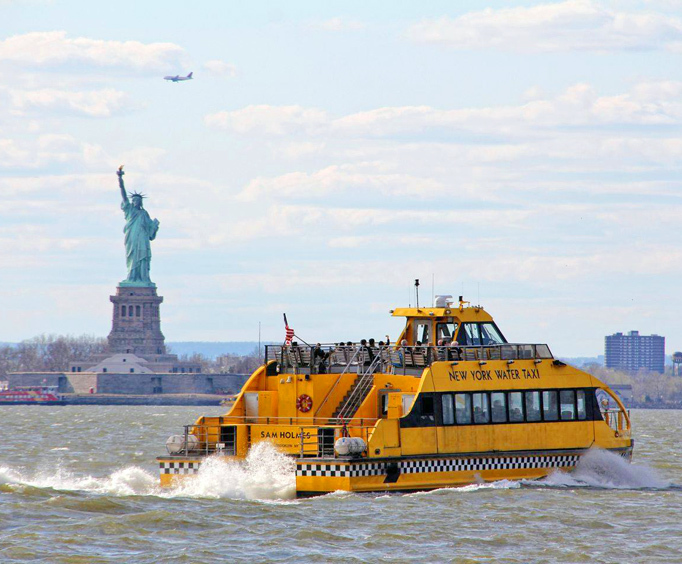 Along the waterfront, Statue Cruises offers ferries to the Statue of Liberty and Ellis Island. The park is also the site of the East Coast Memorial which commemorates U&period;S&period; servicemen who died in coastal waters of the western Atlantic Ocean during World War II, and several other memorials. Chelsea Piers is a series of piers on the West Side of Manhattan in New York City in the Chelsea neighborhood, on the northern edge of Greenwich Village and the Meatpacking District. They were a passenger ship terminal in the early 1900s that was used by the RMS Lusitania and was the destination of the RMS Titanic. The piers are currently used by the Chelsea Piers Sports & Entertainment Complex. Hunter's Point South is located on the waterfront of Long Island City in the borough of Queens in the city of New York. It is a newly developing neighborhood with high -rise apartments, an incredibly beautiful park and unobstructed views of the world famous New York skyline. 34th Street is a major shopping street in NYC. Though it endured a decline in the 1970s, it rebounded late in the 20th century with new stores and new energy. Between Seventh Avenue and Broadway, one will find Macy's, the famous department store immortalized in the Christmas movie Miracle on 34th Street. It claims to be the "world's largest store." The annual Macy's Thanksgiving Day Parade ends on 34th Street.